If you're looking for a compact camera with a big zoom, the Panasonic LUMIX DMC-TZ10 is a fine choice. It even includes a GPS receiver, so you can pin-point where you took a particular photo. Photos look good for the most part but suffer from softness and noise. The best aspects of the camera's image quality are its surprisingly shallow depth of field and bokeh patterning. Panasonic's LUMIX DMC-TZ10 is one of the most feature-packed and versatile point-and-shoot digital cameras on the market. It ships with a big lens, it has lots of automatic features that make it easy to use as well manual modes for when you want to get creative, and it even includes a built-in GPS receiver so that you can see where your pictures were taken. Having a built-in GPS unit means you can easily identify where your pictures were taken throughout your travels. The location labels can be set to identify each photo by country, city, suburb or landmark, and you can see this information overlayed on the camera's screen when you view your snaps in playback mode. Alternatively, you can view the location information when you load your photos in the supplied PHOTOfunSTUDIO software. The camera doesn't record location data in video mode. The GPS initialises quite quickly the first time you use it, and different icons are used to let you know how long it's been since the GPS last received location data. Sometimes, the location data can be misleading if you choose to display the landmark information, and the suburb information can be a little off too (you can edit this info though). For the most accurate results, you can try updating the GPS information manually before you start shooting. 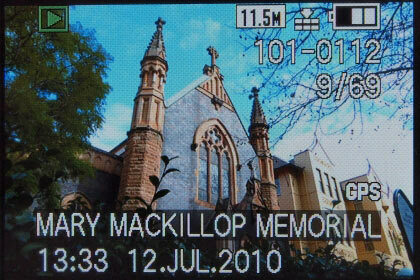 The landmark information correctly identifies this as Mary Mackillop Memorial Chapel. 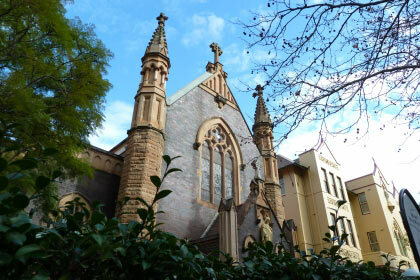 This is not Mary Mackillop Memorial Chapel (it's across the street). The GPS stays on even when the camera is switched off and there is a green light that periodically flicks on and off to inform you of this. You can use flight mode to disable it, but the GPS will activate again once the camera is switched on. Many airlines allow the use of GPS devices during cruise, but some still don't. You'll have to check with your airline. While the built-in GPS is one of the cool functions of this camera, the main drawcard — as always with travel zoom cameras — is the zoom lens. It has an optical reach of 12x, which allows it to shoot from a wide angle of 25mm all the way to a tele-zoom angle of 300mm (35mm equivalent). The zoom rocker is loose and easy to use and the zoom operation itself is relatively smooth. You can use each zoom level from 1x to 12x by just jabbing the rocker lightly. The widest aperture of the lens is f/3.3 at 25mm and it closes to f4/9 when you zoom in to 300mm. The smallest aperture you can use is f/6.3, but we would have liked it to close to f/8.0. When trying to capture very bright scenes, the fastest shutter speed you can use is 1/2000, and the lowest ISO value is 80. A dedicated exposure button on the rear of the camera lets you switch between the aperture and shutter values easily when in manual mode, and you can change the ISO speed (and adjust most of the camera's other main features) by pressing the Q.Menu button. It takes some time to get used to the main menu and the Q.Menu, and it's easy to forget the Q.Menu button is there. There is a 12.1-megapixel CCD sensor behind the big lens and it's quite small at 1/2.3in (for example, the Samsung EX1 compact camera for enthusiasts has a slightly bigger, 1/1.7in sensor), but it's on par with other cameras in its class, such as the Canon Power Shot SX210 IS, and it's the same size as the Panasonic LUMIX DMC-TZ8. 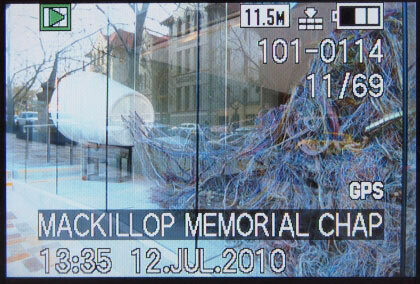 The rear of the camera has a 3in LCD screen through which you can frame your photos, and it can be hard to see in bright sunlight. It's a sharp screen though and the on-screen information it displays is very useful. The button layout is the same as the LUMIX TZ8, but it doesn't have an E.Zoom button. In its place is a much handier button for video recording. It lets you shoot footage at 720p without you having to first fumble with the mode dial; this is perfect when you're travelling. Images shot with the LUMIX TZ10 are good enough for social media sites and prints up to A4 in size, but pictures do look a little soft and highlights tend to get blown out — especially in iAUTO mode. Chromatic aberration is also noticeable in high contrast areas and can be a consequence of overexposure. Basically, while the iAUTO mode is very useful it won't work magic; you'll still have to make sure your subject is properly lit and you may even have to fight with the manual modes to find the optimum exposure. Colours are captured well, and this difficult scene is mostly well illuminated, but the bright sky shows clear chromatic aberration against the tree branches. This is another difficult scene, but the camera has done well to capture the colours just as we intended, without overcompensating. While the camera captures colours accurately, the softness and haloing in some instances will be too noticeable, and if you want to crop your images then you'll end up with displeasing results. 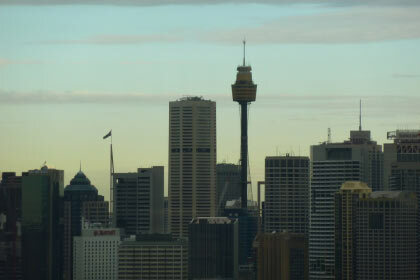 Viewing photos at their full size will show a lack of definition as well as discoloured pixels. The lack of definition will be accentuated if you've taken photos at full zoom, where camera shake, coupled with a small aperture, can also contribute to blurriness. 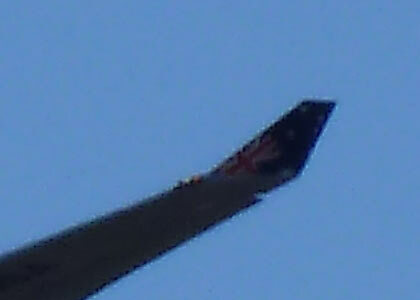 On bright days the tele-zoom can come in handy, especially if you're a plane spotter. But you won't want to crop too much out of the photo, otherwise it will end up looking very poorly defined. One of the things this small camera does surprisingly well is create a lovely bokeh effect when you're shooting objects at a shallow depth of field. Macro photography is one of its strong suits and you can get nice and close to your subject — within a few millimetres — to capture plenty of detail. 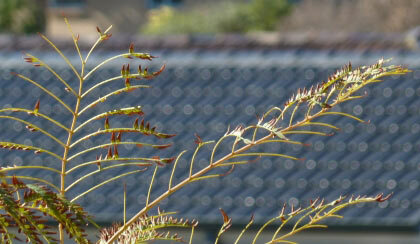 We love the round bokeh effect of the sun reflecting off the roof tiles in the background. But the branch in the foreground still looks soft. Despite the softness of its images and the poor definition when you examine the photos closely, the LUMIX DMC-TZ10 is a much better camera than the DMC-TZ8 and the inclusion of a GPS device makes it an even better proposition for travellers than previous travel zoom models. It also has improved controls compared to the TZ8. We like its close-up capabilities and depth of field characteristics, and the big zoom can definitely come in handy when you want to shoot close up details while visiting Sagrada Familia in Barcelona, for example.